One of the cutest little pets you could get is a hamster. Notoriously adorable, mischievous, and curious, these little guys make for great pets for kids who need a furry buddy to keep them company without the need to drool. These awesome little hamster cages have everything your fur buddy needs to keep him active, happy, and safe. This cute little cage has two floors for your cuddly critter to scurry around in. The bottom floor is perfect for lining with sawdust for your hamster to burrow in. The second floor has a wire bottom, and a ramp that leads down to the lower level. The cage comes with a hamster wheel built in, and comes with a water bottle, a food dish, a hamster hutch for snuggling in safely into the corner. One of the features we love about the Ferplast Hamster Cage is that its plastic base is completely transparent. That means you can watch your pal burrow into his sawdust and you can play games with him while he’s in his home feeling secure. If you love a novelty home for your hamster buddy, this is one of the most fun options you could choose. 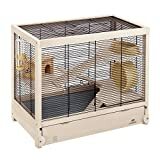 This is a taller cage with multiple platforms for your hamster to climb up to, with a double door hutch at the top. The hutch is reminiscent of an animal face, which adds just a touch of whimsy to this cute little home. The Prevue Hamster Haven is colorful, and fun. A slide, and hamster wheel come with this fun habitat. This cage comes in multiple color options and has two access points for easy retrieval and cleaning. If your daughter loves pink, and wants to keep her hamster in her room, this is the perfect, transparent hamster cage for you. 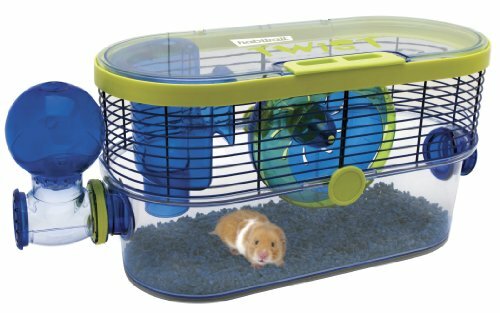 This adorable, durable plastic and wire habitat comes with a food dish, water bottle, and exercise wheel. 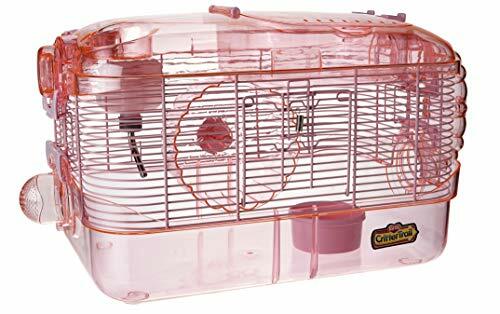 The Kaytee Critter Trail Pink also has a climbing tube for your exploring hamster to make his way up toward the top hatch where you can retrieve him easily for playtime or cage cleaning. 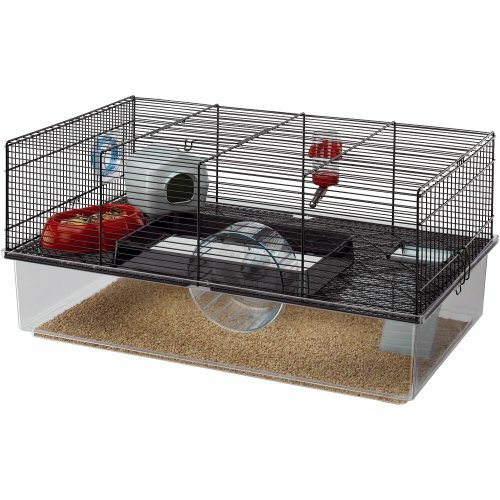 If you prefer for your hamster not to walk on wire caging, the Iris Deluxe is your best bet. This fun, plastic cage with only wire fencing on either end for ventilation offers climbing ramps and slides, an exercise wheel, hamster hutch, and an easy-access roof panel. The Iris makes for a great starter kit, coming with a water bottle, food dish, and has two easy access points for cleaning. Another totally transparent hamster cage, the Habitrail Twist is a fun, colorful habitat for your hamster pal. 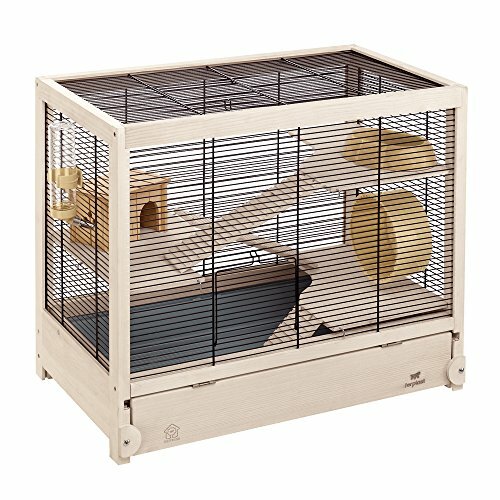 These hamster cages are the perfect base for building a crazy climbing habitat for your hamster to climb and play to his heart’s content. The Habitrail has an easy access top opening, and comes with an exercise wheel. This perfectly fun hamster cage gives you completely clear views and gives your hamster tons of circulation as the top half is made of wire. The Ferplast Hamsterville is a bit of the chic model in hamster homes. This cage is made of sustainably produced wood and has more neutral tones used for the design. The Ferplast Hamsterville comes with an easy-to-remove tray for easy cleaning. The Ferplast also has four platforms, a hamster hutch, multiple ramps leading to the various levels, an exercise wheel, and water and food dishes. 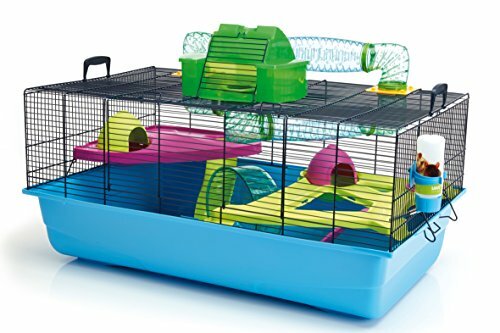 This brightly colored, super fun hamster home is probably one of the most options available. The Savic Heaven Metro comes with multiple, brightly colored platforms and hutches. The ladders comfortably assist your furry friend to climb around and explore. The best part of the Savic Heaven Metro, though, is the climbing tube that actually takes your hamsters up and out of the hamster cage, up to its roof for a higher view that will surely make him happy. We bet you’ll find your hamster roosting in the hutch atop the roof pretty often. The Savic Heaven comes with water bottle, food dish, and all the ladders, platforms, and hutches mentioned. Your little furry friend will have a happy life in this hamster heaven. Your hamster buddy deserves the best home possible. 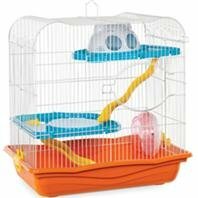 With these fun, interesting habitats and cages available in bright colors, or neutral shades, all with great ventilation and easy accessibility, your hamster is bound to love his life of climbing, burrowing, and exploring.